A few weeks ago I discovered this little girls’ dress at Tea. I loved the dress, but $65 was a bit more than I’m willing to spend on clothing for my daughters (about $55 more, to be exact). So of course I had to try to copy it! The only problem was that when I finished the skirt portion of the dress, I wanted it for myself. So yeah, I stole it. I slapped a knit fold-over waistband on it and made it mine. 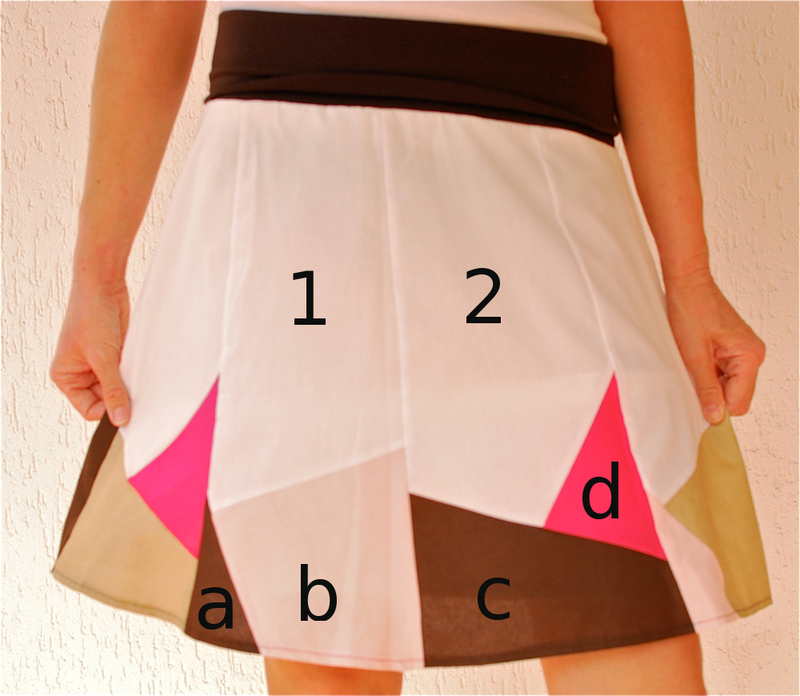 Every other skirt panel is the same. I labeled these “1 & 2”. Then I attached pieces a & b to panel 1, and pieces c & d to panel 2, alternating colors so they never touched. I made 8 panels, you can make more panels for more of a circle skirt. You will either need to gather the top or taper the panels more though. The colors are a little warped in these pictures, but it’s a dark pink, blush pink, camel-y tan, and chocolate brown. The brown waistband is actually the same color as the chocolate brown. 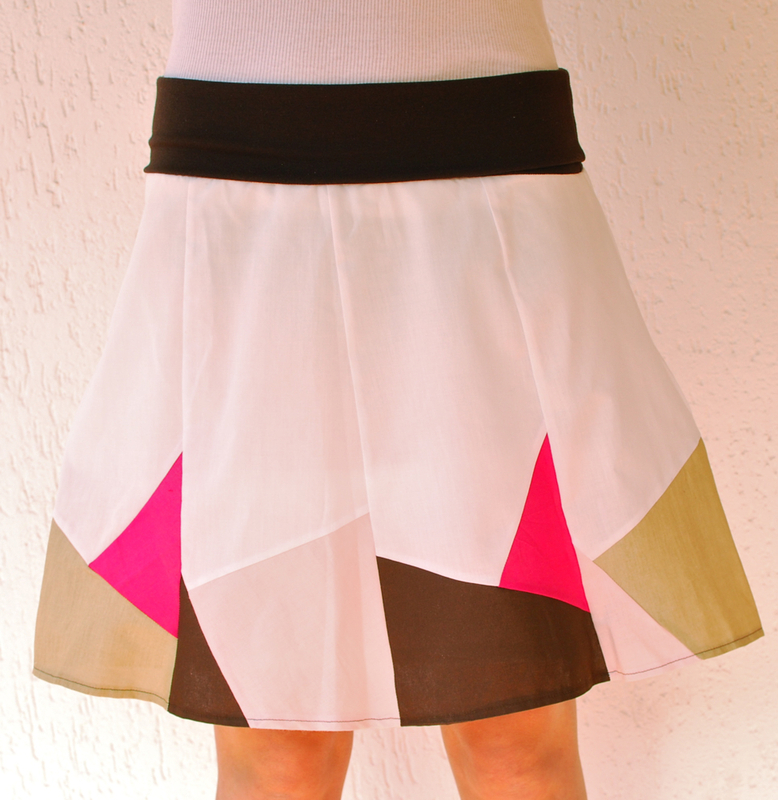 « Skirt Week: A-Line Skirt Winner!! Very cute! That dress is now on sale for $39.50, just in case that’s important to you at all. LOL! Love this!!! Is each panel narrower on the top then the bottom? Also, do you have suggestions for the ratios??? One last question :) did you use knit for the entire skirt? That is way tooo cute. I think I will have to make this for myself over the weekend. Oh you clever thing! This skirt is darling. And look, 1,000 followers!! Amazing! Congratulations! I think you had 4 when I first stumbled upon you, you’ve come so far!! awesome skirt! i love the colors! I love it too. I love anything Tea, but they are a bit pricey! That’s great! I am a fan of copying those outrageously priced clothes! Love this one! I’m adding this to my way-too-long-list of projects to do. Thanks! So very cute! It is nice to see a fresh design! That is so cute. I’m definitely going to have to give this a try, especially as panel skirts are so flattering. This skirt is GREAT !!! Thank you for the inspiration.